On 27th of February 2018, the All-Party Parliamentary Group Friends of Syria held a meeting discussing issues around rebuilding Syria, and possible UK policy options. Speaking were: Reem Assil, founding member of the Syrian Nonviolence Movement, co-founder and co-manager of the Free Syrian Translators, and chair of the Syrian Platform for Peace; Tobias Schneider, an independent international security analyst and co-author with Faysal Itani of a recent report for the Atlantic Council titled Rebuilding Syria: A Localised Revitalisation Strategy; and Fadi Hallisso, co-founder of the Syrian NGO Basmeh and Zeitooneh, part of We Exist, a civil society umbrella group. The meeting was chaired by the Rt Hon. Andrew Mitchell MP, Member of Parliament for Sutton Coldfield and co-chair of the All-Party Parliamentary Group Friends of Syria. The transcript below has been edited for length and clarity. These meeting notes are also included in the Summer 2018 issue of Syria Notes, along with other articles on reconstruction issues. Good afternoon everybody. Welcome to this meeting to discuss reconstruction in conflict around rebuilding Syria. We’re going to hear from our three guests in a moment. I wanted to just say a word or two about reconstruction in Syria. These appalling catastrophes tend to end in one of two ways: either that there is an outright military victory imposed, or there are political negot­iations. It’s always been clear that in Syria there wasn’t going to be an outright military victory, and we’ve seen the appalling events outside Damascus in the last few days. In which case of course one needs to focus on the negotiations and the political discussions, which are proceeding in a faltering way. I personally find the most interesting historical document to look at in respect of these negotiations is the Treaty of Westphalia, which ended the Hundred Years War. And the way in which these negotiations take place basically as a three ring effort. The first ring is the major powers who are involved. The second ring is the militias if you like, and all the fighting groups., who have to be brought in one way or another, often with many false starts, into the negotiations. And the third, and in many ways the most fundamental part of the negotiations, is from the bottom up, and it’s getting all the different groups, what is left of civil society, to be able to put in their own views, and feel they too are part of the negotiations. Now we’re a long way from that happening, but at the point where there is a critical mass in all of this, then people are able to focus on the reconstruction of Syria, and David Cameron made it clear when he was prime minister that Britain would put forward a billion pounds at that point towards the reconstruction of Syria. It is going to cost many, many billions of pounds to reconstruct Syria, but at that point Britain with its immense knowledge and understanding and leadership on international development ought to be able to convene conferences to help address aspects of reconstruction, and to do so very effectively. Good afternoon ladies and gentlemen. It seems actually to me surreal to be talking about reconstruction in Syria while civilians, human lives, people just like you and me, are being targeted and killed, in Ghouta especially in recent days, maybe in this very moment as we speak. Yet it makes perfect sense, as reconstruction and peacebuilding in my opinion become most needed when a conflict hits the deepest point of devastation and destruction. But this task of reconstruction and peacebuilding can’t be tackled spontaneously and aimlessly. You will notice that I always link reconstruction and peacebuilding together, and you will agree that there is no point in reconstructing something that risks being destroyed the next day, so it makes sense to bring peacebuilding in when we talk about reconstruction. There is in peacebuilding studies a term that was est­ablished by John Paul Lederach who is a well-known scholar in this area, and I like this term very much. We are all familiar with conflict resolution and conflict management, but actually Lederach prefers to use the term conflict transformation, as he sees conflict to be first of all normal in human relationships, and also as a mode of change, therefore conflict is for him an opportunity, a gift. Understandably, this might sound unrealistic for many of you, especially when looking at what is happening in Syria now. But the answer lies within the concept of conflict transformation. It’s more than a set of techniques, it is a way of looking at, as well as seeing a conflict. Looking and seeing are very different. They both require lenses, to use a metaphor. Conflict transformation suggests a set of lenses through which we view a social conflict. The lenses of conflict transformation show: one, the immediate situation; two, the underlying patterns and conflicts; and three, a conceptual framework. Now let’s use what is happening now in the suburbs of Eastern Ghouta as an example. Assad and his allies are targeting and killing civilians using internationally prohibited chemical weapons, despite the many international resolutions and the latest ceasefire agreement. This is the immediate situation. And what Assad does, and has been doing for the last seven years, is actually he pushes the international community to stay in the firefighting square, forcing everyone to look at what is happening in Syria using only one lens, the one to look at the immediate situation, rather than seeing the whole picture using all three lenses. Assad and his allies over the past seven years have been very basically showing their level of arrogant contempt for the international community and its decisions, yet no-one seems to be using the second and third lenses to see the underlying patterns and context, and to see what conceptual framework is needed for it. In the example of the al-Ghouta events, it is simple. We all know that a beast without teeth is nothing to be afraid of. Laws without accountability become only a set of texts that no-one will care about. We all know from our daily lives that if we put a ‘no parking’ sign on the street we put alongside a civil enforcement officer roaming the street, recording the details of every vehicle violating the regulations, we make people pay penalties when they ignore the sign, and if they refuse to pay, we take them to court. A ‘no parking’ sign without any consequences would be ignored by everyone. I don’t seem to be able to understand why we take our ‘no parking’ signs very seriously while we can be very permissive about ‘no killing’ signs. Here the second and third lenses are of particular importance: the context and the recurring patterns, and the conceptual framework. A framework for reconstruction and peacebuilding can transform the conflict, where we can engage in constructive change that goes beyond the resolution of specific problems or the current situation. We need a conceptual framework that holds these perspectives together, one that permits us to connect the presenting patterns with the deeper relational patterns. Such a framework can provide an overall understanding of the conflict while creating a platform to address both the presenting issues and the changes needed at the deeper level. Conflict transformation lenses suggest we look beyond the al-Ghouta events or the reconstruction process in the future. It suggests to see the context of the relationship that is involved and then look back again at for example the al-Ghouta events or the current situation. Not being satisfied with a quick solution that may seem to solve the immediate problem, conflict transformation seeks to create a framework to address the content, the context, and the structure of the relationships. Conflict transformation as an approach aspires to create constructive change processes to the conflict. Those processes provide an opportunity to learn about patterns, and to address the relationship structures, while providing concrete solutions to presenting issues. It is really important to keep in mind that no matter how devastating the current situation is, conflict brings with it the potential for constructive change. Positive change does not always happen, of course. Longstanding cycles of destruction and hurt may continue, but the key to transformation is a pro-active bias towards seeing conflict as a potential catalyst for growth. Conflict transformation is to envision and respond. Respond suggests that vision must result in action, engaging the opportunity. The trend is always towards involvement. And we now have an opportunity. We wasted so many opportunities in the past. The escalation in al-Ghouta is an opportunity today. So will we engage, will we seize this opportunity? How can we use it to push towards a deeper involvement in the right direction when it comes to reconstruction in Syria? What type of reconstruction is right for Syria? We know there are two approaches, one from the top to the base and one from the base to the top. Which is right for what is happening today in Syria? I think my colleagues will shed a light on these aspects. Thanks for listening. I’m here on behalf of the Atlantic Council, and we put out last Autumn a report called Rebuilding Syria, with a subtitle, ‘reconstruction and legitimacy.’ And that’s the larger theme of what I want to talk about, the necessity of rebuilding, thinking about rebuilding now, start planning for rebuilding now, but keeping all that in mind in the context of legitimacy and politics. And I want to take a little bit of contention with something you said before, when you said conflicts tend in two directions, either military victory or a political solution. The original conception of our project took as an assumption that neither of these things are going to take place in Syria; that it is unlikely that one of the parties is going to be able to score a decisive military victory. Even if Bashar al-Assad were to survive in power, he would be compromised and there would be territories within Syria that would remain outside of the control of the central government. At the same time we were extremely sceptical about the prospect of any sort of negotiated settlement. Now the latter is a big problem for us specifically in Europe, because we have heard over the years that there is going to be no reconstruction funding absent a political solution that is acceptable to all or a critical majority of Syrians, and that would presumably mean that Bashar al-Assad would be transferred out of power. So given that, is there any point in speaking of reconstruction at all? About anything beyond stabilisation in critical areas, humanitarian assistance in critical areas? And our thinking was that yes indeed there is, specifically from a European perspective where we have to start dealing with the prospect of large chunks of the population—we’re talking about millions of people in these territories outside of central government control—that have been living for years already in limbo, and that will likely continue to for the foreseeable future, for years and decades to come. A significant chunk of them won’t able to return to their homes at all, either for political reasons or because their homes simply do not exist any more. Many others will want to return to Syria but will only have the opportunity to return to areas that are outside of central government control and that are currently not able to absorb these populations or sustain these populations. So from a pure national security interest—we like to talk today a lot about counter-terrorism frameworks, radicalisation frameworks—but also from a purely humanitarian instinct, we ought to start thinking about pragmatic ways that we can do small scale, wherever it’s possible, reconstruction efforts within territories in Syria that are conducive to that. So that was the premise of our programme, a two year programme with advisory sessions, with multiple consultations with civil society and with implementors, the UN etcetera, as well as a number of smaller and larger reports. The report from last Autumn is part one, co-authored with my colleague Faysal Itani. It deals with the political strategy, and the way we think about the various trade-offs that are involved in such an approach. Part two, at the end of this year, will deal with the technical aspects, and so on. In terms of identifying opportunities, and identifying spaces where we think small scale reconstruction efforts, and scaled up stabilisation can take place, in our report we identify three areas. These were: the opposition area in the south [Daraa]; the Turkish-backed area—at the time that was only the Euphrates Shield area in the north, but things have shifted a little bit and we are considering reintegrating Idlib and the north-west pocket again, depending on how the situation evolves; as well as the US-held, Coalition-held, north-east SDF-held parts of Syria. We made a conscious decision to bracket out the Assad regime. There’s obviously a humanitarian imperative to try and support populations that have no other choice but to survive under Bashar al-Assad, but I think policy in the UK as well as other Coalition members is relatively clear in that regard. Something I do want to push back on is the emerging narrative that somehow by leveraging reconstruction assistance that we could achieve political goals in Syria with Bashar al-Assad, that somehow by tying assistance to political measures, saying we will rebuild certain areas if certain local government thresholds are met etcetera, this is something that we in our report spent a long time pushing back against. We do not believe that is a realistic prospect. We do not believe the Assad regime is conducive to that. We do not believe they have interest in that kind of money. I think Damascus still believes the war was a conspiracy against it, and it has no interest in allowing us to do what they would consider to be reconstituting populations that they consider hostile to themselves. So that notion that has been advanced in various corners, we want to push back against, and beyond that refocus entirely on opportunities that exist within non-government held areas. And here we focus obviously on sectors that are high priority: housing, WASH, education. Things that are not only necessary to sustain and enable civilian life in a given area, but things where we do have some experience of local stabilisation and humanitarian emergency response work that we can build on. In our report we identify priority regional and local partners, who have some experience gathered over the years with local councils and provincial councils, as well as the Syrian interim government, that have been complex and difficult at times, and obviously very corrupt, and there has been diversion etcetera, but we do think they have been able to establish a certain amount of best practices. When you look for example at Euphrates Shield areas in the north of Aleppo, we are able to come to arrangements with our regional partners, Turkey here specifically, international donors as well as local civic institutions and local civic partners such as the Stabilisation Committee, to bring in stabilisation aid, to bring in rehabilitation aid. And eventually we think we can scale some of these projects up to the point where they would constitute reconstruction, and provide sufficient spaces on Syrian territory for Syrians to sustain life, sustain civilian and civic engagement. It’s important not only for populations who are in the area but also for diaspora and refugee populations in the long term to have some sort of foothold on Syrian soil that is not regulated by Bashar al-Assad. There are obvious extraordinary difficulties and limitations to that kind of approach. The prerequisite is that there obviously needs to be protection from violence by the central government and other powers. Currently that is only the case in SDF-held territories in the north-east where the Coalition has created a de-facto no-fly zone, and has pushed regime military offences back, as well as the Euphrates Shield territory that is held by Turkish forces. We are curious whether similar developments will happen in Idlib. In Idlib obviously we have the added problem of radical militant groups, something that has caused especially Western governments to be extraordinarily hesitant to send money into the area with the potential for diversion to groups that are classified as terrorist organisations. On the other hand we also have another problem in the SDF-held territories, where obviously our core regional partner in the area, Turkey, considers the governing portion of our local partner to be a terrorist organisation. We have had trouble shaping local governance to the point where external donors will be willing to invest in that kind of environment or be able to access that kind of environment. So given local minimum standards as well as protection from external bodies or government bodies, we think that there are opportunities where we can start rebuilding now, we can start planning for rebuilding now, absent a total political solution, absent a total military victory by either party. Essentially I wanted to speak about how civil society regards reconstruction in Syria. All the talk about reconstruction have been really a reason for concern for us, since last year at the Brussels Conference when at a certain moment it appeared the conference was going to focus on this issue, but then at the beginning of the conference the Khan Sheikhoun attack happened and no one there would bring it up in public. But before that I want to say that civil society in Syria has been involved in reconstruction for the last four years. All over the country there were examples of active organisations trying to deliver in place of the state’s institutions that collapsed. The big obvious examples are the medical organisations like UOSSM, and SAMS, and others, who were rebuilding the health sector that collapsed, supporting the population to do civil resilience efforts, the Civil Defence also who have done a great job. The local council experience, even though it has a lot of bad examples, bad apples, but also there are a lot of good examples of local councils who managed to hold elections for the first time in the last five decades of Syrian history. Our own community centres played a part in facilitating those elections, and registering people and encouraging the candidates. So reconstruction was going on, with the support of many generous donors who believed in the role of civil society, and of Syrians. And we hope, in the way that Tobias mentioned, that these efforts in areas outside the control of the regime will continue. Unfortunately we are seeing some signs of withdrawal from northwest Syria. We saw recently some take the decision to draw down projects because of the influence of HTS. But a few days later we saw a huge military campaign to kick out HTS from Idlib, something I will return to. So from our perspective, in regards to reconstruction inside the regime controlled area, we believe that any funding for reconstruction without political transition is very dangerous. It is like rewarding Assad and his allies for all the killing they have done in the last few years, without any kind of accountability. It is also a very dangerous precedent on the international level, that anyone could do similar actions in their own country, and as long as they can blackmail the West with refugees, they can get what they want: not only ‘get out of jail free’ cards but also free money to distribute to their crony allies inside the country. The regime is already promising Chinese, Russian, and Iranian com­panies to get the biggest share of the cake from the reconstruction efforts. We are already seeing plans being developed here and there. So if pressures on the EU and other Western countries to be involved in reconstruction succeed, it would mean only financing those companies and the regime’s allies, and businessmen who are mostly on your sanctions list. What we have seen in the last year is that reconstruction on Assad’s terms means only demographic change sponsored by the state. Last year Decree 66 was introduced, and through this decree the state was dispossessing inhabitants of large areas around Damascus from their property rights, promising them small financial compensation or shares. They are trying to mimic what happened in Lebanon with the reconstruction of downtown Beirut by giving shares that mean nothing with low financial value that would not even allow people to re-buy their properties. This plan includes a huge area from Al Kadam to Daraya in southern Damascus. If you want more details about that, I would recommend reading articles published by Joseph Daher, a Syrian activist who wrote a lot about this issue, or Jihad Yazigi, a Syrian economist, also publishing extensively. Similar plans were done in the same way in Homs. There is a plan to rebuild Baba Amr, and to establish new condos. There are plans in Aleppo. We heard about an agreement with the Aga Khan Foundation for two billion dollars to rebuild the Old City of Aleppo, an area which used to have 200,000 inhabitants. Today, all of those won’t be permitted to go back. Of course the agreement says clearly that the Ministry of Culture will take control of the plans to rehabilitate the area. And you know the regime’s plan even from before for downtown Aleppo, for downtown Homs, the famous project for Homs, was to just kick out the inhabitants and build five star hotels and shopping centres. This is the way they understand development. And today with the war they got a piece of what they want, by kicking out six million of the poorest of the population, and confiscating their homes with these decrees. The third point is that while these advocates for involvement of the European Union in the reconstruction of Syria have been saying this is the way to stabilise the region, and to prevent refugees from coming, I would say it would have the contrary effect: it would destabilise the region. It would mean that millions of refugees, mostly Sunni refugees, who are residing in Lebanon and Jordan, won’t be able to go back, which would be a very important destabilisation factor for Lebanon, a small country like Lebanon. I am based in Beirut. We’ve already seen a huge pressure on the refugees from the political elite. They used to call the de-escalation zones as safe zones, and ask to send the refugees back to those zones. Today this de-escalation has collapsed all over the country, and they are busy with their own election, so they are not talking about this as often as before, but sooner or later the pressure on sending refugees back will again be in the news, and honestly there will be no place to send them back to. What recommendations do we have? We do believe that, although Tobias said the regime is not interested in Western money to reconstruct the country, they do not have the resources to do so. The reconstruction would cost, some estimate, about 350 billion US dollars, and the regime doesn’t have these resources. Jihad Yazigi I think estimates the reserves of the private banks to be 3.5 to 4 billion dollars, and maybe the public banks have double the amount. The Russians are clear that they won’t be paying for reconstruction. Maybe the Iranians have some interest in paying a bit, but all this won’t be enough, and without external investment from the EU, from the Arab Gulf countries, there will be no way for the regime to manage a viable state. Somehow we were a bit surprised by the escalation on Ghouta, because the Ghouta besiegement was a main resource for the regime’s economy. Hundreds of millions of dollars were pumped into Ghouta in the aid effort, at prices that are not normal anywhere on this planet. They were a main source of funds for the whole effort of the regime. So we believe that leveraging reconstruction funding is a card you can play once, and after you play it you lose it, so we hope it is used wisely. The second recommendation is to still support the Geneva process, to achieve at least the minimum for a political transition. It appears that somehow everyone is going to the Astana process or Sochi recently, and the focus has shifted to the constitutional committee, while Geneva has gone totally cold. If there is any hope even for small steps on a political transition, it will come through the Geneva process, not any other process. Our third recommendation would be for the West to engage actively in dialogue, with the Russians, and especially with the Turks. Turkey is still holding a lot of keys in the region, and they have proved in the last two months that they are just waiting for the right partner. We’ve seen reports that Turkey was allowing weapons to be channelled to those fighting HTS. They even allowed some military factions to join the fight against HTS, so once they decide to kick HTS out, they will do it. And how to go forward and engage in reconstruction policy in the Euphrates Shield area? Until now there is no clear policy. At the beginning, the Turks wanted to do everything on their own. Today we’ve seen that they are allowing projects to take place there, so we need to engage as well in dialogue with the Turks, and with the Jordanians for the south, to start having reconstruction efforts in those areas, to support the return of refugees if possible. But also to be cautious. Turkey was using language that after liberating Afrin from the Kurdish forces, refugees would be able to go back, but if they start sending Arab refugees who don’t belong to Afrin there, that will also be another destabilisation that we should be cautious about. Thank you very much. I agree with what Fadi said about the importance of engaging in Geneva, as well as Sochi and Astana. It’s very important that everyone of goodwill is who wants to try and help reassemble the fabric of Syrian society is heavily engaged. And we now have time for questions. I’m from Syria Solidarity UK. I’m addressing my question to Tobias, because although all three of you very encouragingly agreed on a bottom up rather than a top down approach, and the role of civil society still existing in opposition areas, I was more surprised to hear the Atlantic Council pushing the bottom up approach, and considering reconstruction of opposition areas. It is a very pragmatic approach: Don’t wait for peace to break out because it’s not likely to do so relatively soon, but work with the opposition areas to stabilise those areas and reconstruct those areas. You pick out three areas, and I suppose that might be extended. Two are quite small, and the third is quite extensive. One in the south near Jordan, one in the north near Turkey, the Euphrates Shield area, and the third, the SDF area, other people might call it Rojava, or the Kurdish cantons, but I don’t want to introduce a sectarian element, that’s not really the point. What I want to know is whether you consider now that the situation has changed since you wrote that report, in that Turkey and the US are not such good friends any more. And secondly and more importantly, will the US and Europe put the resources into those opposition areas before there is any transition to peace? We started our process almost two years ago when reconstruction wasn’t as high on the agenda, and US, while it did have the ISIS mission ongoing, it had not yet made policy decisions about long term presence, and the future of Rojava, or the SDF area, or whatever we want to call it, the northeast. As I understand, planning is for eighteen months, and there’s a line being drawn up to stabilisation. Now we all know that’s a very sort of fluid barrier between humanitarian aid, stabilisation, rehabilitation, reconstruction. Now we do have very specific problems for that area. Some of these have been specifically raised by the European partners. Over last Summer there was a meeting between the various European envoys in which they set conditions for European assistance to those territories to be governed with the inclusion of more mainstream opposition and more mainstream—again I don’t want to talk about sectarianism or nationalism either—but Arab representation, and that is not something we have addressed. Our inclusion is based very much on the immediate policy map. Now there’s eighteen months, and there is quite a lot of resources behind it, for stabilisation. There’s not yet a lot of external buy-in from the Europeans or from the Gulf, but the Americans have put in one hundred million dollars for pilot projects. We’re talking in core sectors, electricity, water, housing, but also agriculture rehabilitation, which is extraordinarily important, and hydrocarbons that not only have impact on the immediate neighbourhood that they’re in, but they also bleed into other areas. Nazir Ahmed from the House of Lords. You haven’t really mentioned anything about Iran, or the GCC countries, particularly Saudi Arabia, in this peacebuilding or reconstruction? I don’t think the Arab Gulf countries will be involved in reconstruction unless the United States takes the lead. Iran’s role is worrisome for us, because I don’t think that they make all those investments in Syria just to be kicked out by the Russians. Of course Iran’s presence in Syria is a destabilisation factor. I’m the Member of Parliament for Bristol West and Chair of the All-Party Parliamentary Group for Refugees. I just wanted to zoom in on the refugee argument, which is I get the argument for reconstruction and rebuilding before the conflict is over, but given we have the political impact as well as popular public impact of pictures from places like Ghouta, which we are seeing every day at the moment, how am I as a politician supposed to help build confidence in returning populations that there is something to return for? I get that the detail may be different, but if there’s a big image of what Ghouta’s looking like at the moment, how should I go about encouraging returning populations, perhaps in Lebanon, perhaps elsewhere? I live in Lebanon myself. I’ve been there for the last eight years, and although I am very privileged to be counted a refugee, this is my status. I have problems in renewing my residency. I was rejected twice in the last two years. So I don’t think any Syrian would love to stay in Lebanon or in Jordan. Living conditions are very tough, but we have to be realistic. Among the refugees we are working with are thousands from Qusair town, and I use this example. I ask the Lebanese who ask me cynically why people don’t go back to safe zones. I say look, Qusair is next to the border, there was no hostilities there for the last three years, why do you think people aren’t going back? If you are not able to face this question because of Hezbollah, and if you are not able as a Lebanese to ask Hezbollah to withdraw and allow these people to go back, they won’t. And you don’t have the right of talking to us in a condescending way and asking us to return. So people want to return, but the conditions aren’t there yet. And what we can ask politicians and policy makers in Britain or the EU, is to make sure that there is a solution, to ask you for more support for the Geneva process, although it is very complicated, even though bringing Russia and the Syrian regime in seems the most complicated task. If people aren’t assured that they won’t be harassed if they return, arrested or enlisted forcibly, they won’t return. I have a question for Reem Assil, from a minority standpoint regarding transforming the conflict, and peacebuilding in a sectarian point of view, What kind of approaches do we have for, let’s say the Christians, Alawis, Sunnis, to sit on one table, as a civil society not the leadership, and to find a way together? Because that’s the one conflict I don’t see resolved in the next few years, or even decades to be honest. I just want to add a point in terms of reconstruction. Part of that is releasing the hundreds of thousands of detainees, and to stop the security machine that is persecuting people. If you stop that persecuting machine, refugees will come back, and that will counter Syrian government plans to reconstruct using Iranian money to do demographic change. Fadi, regarding civil society’s role in influencing the reconstruction discourse; to what extent are you able to inform those discussions? My question is arguing the point that the critical decision about reconstruction rests on reaching a political agreement on Syria. Can we see it in a different way, that the Geneva talks could end up with regional agreements in Deraa or in Idlib? And this could be considered as a good political situation, or a good atmosphere for reconstruction? My point is that reconstruction, or increasing the development from stabilisation to reconstruction, could help Syrians to build again the civil society and local governance, and to provide a better example for the Syrian state, so reconstruction is really essential to provide what we lost in the last five years, representing Syria and the Syrian people in a different way. I would like to answer the question about how to deal with sectarian conflict, taking into consideration the nature of Syrian society. What I was talking about, using different lenses to see different levels of the conflict, applies perfectly here. So we need to not only address what is happening right now, but to reach out to these different groups, to think about and see what underlying patterns are there, and then see how can their interests best be taken care of, as a piece on the whole map of the Syrian conflict. So this should take into consideration—and this ties with the question earlier about inviting refugees to come back—the structure of Syrian society. 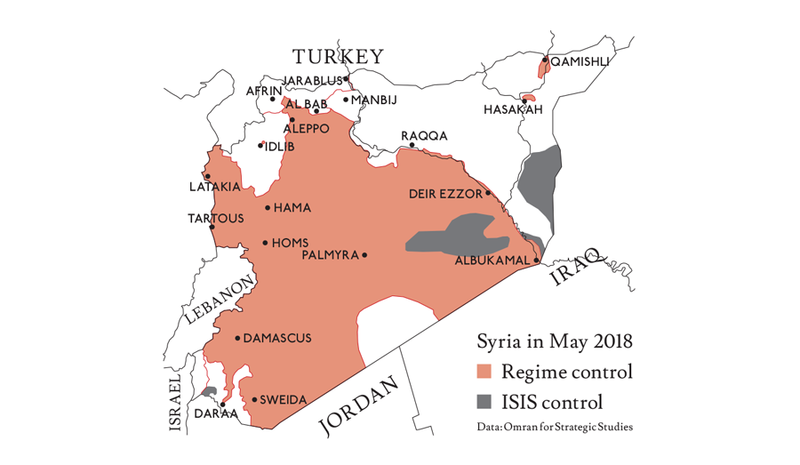 This should be not only looked at, but seen deeply as pieces that reconstruct the whole map of Syria, and the whole map of the conflict; how each of these groups interact with each other, what do they need from each other, what obstacles are there, to re-bind them together in a country that is Syria. So there’s no one magical formula that can state ‘one–two–three if you follow them you will get there,’ but it is rather a dynamic project of deeper research and engaging on the ground with different communities, rather than making assumptions. Our role as civil society in influencing policy makers and the aid sector is very limited so far. Unfortunately we have been trying hard to push for more consultations with civil society, but we are still seeing that decisions are made on a high level and we are just informed afterwards. The last one was for instance a serious decision to suspend a three year peacebuilding programme that was taken without any consultation with us. Sometimes in the best case we are invited to represent civil society with any preparation or planning. And this is shameful. I want to really re-emphasise those opportunities that do exist within these limited spheres absent a wider agreement, to provide lighthouse effects, both political but also economic throughout Syria. If you look at Idlib, southeast Turkey, and north Aleppo combined, you have millions of people, you have four or five million Syrians who live now in a suspended existence. By giving them opportunities to reconstruct their own lives, to reconstruct their politics, something that hopefully can bleed in both directions, both within refugee communities, diaspora communities, but also inside Syria to hopefully have some sort of lighthouse effects. Obviously you’re talking very small scale, not 350 billion, but really what is possible within the current trajectory absent a political solution, because otherwise these people live hopeless lives in broken suspension. Thank you all very much for your questions, and thank you all for coming, and thank you very much to the staff for organising the meeting. The report discussed in this meeting, Rebuilding Syria, A Localized Revitalization Strategy, by Faysal Itani and Tobias Schneider, published in December 2017, is available on the Atlantic Council website.